Complete your final project. Track and document your progress. Create a final project slide in the archive according to the specifications provided. 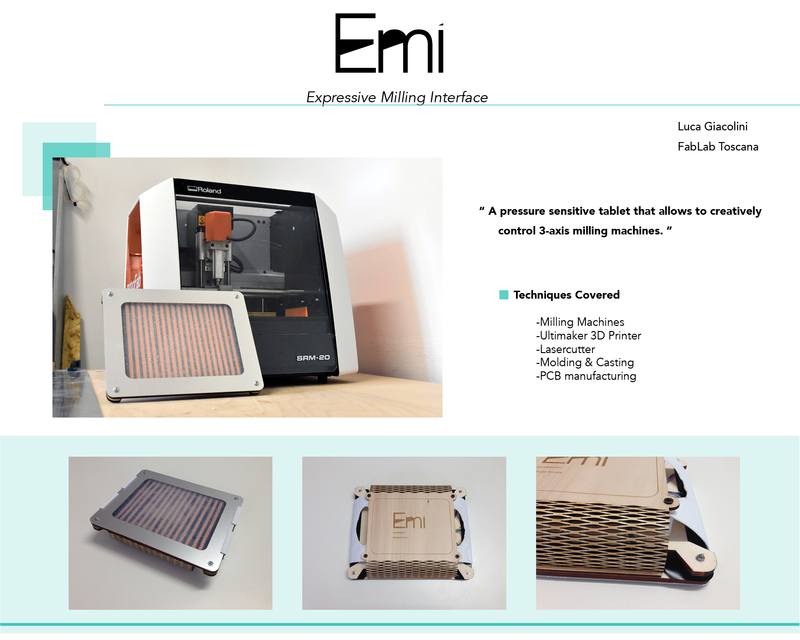 This page begins with a quick introduction on my final project EMI. It then explains all the manufacturing processes, from hardware to software. Could machines evolve into something more co-creational that gives the maker more of a sense of control? EMI will allow the artisan to combine the expressivity of hands with CNC routing. It is a touch tablet with pressure sensors that can be used as a controller for the Roland SRM-20. A matrix of 12 x 16 sensors will detect the location and the intensity of the pressure applied and will move the spindle there. The x and y-axes are mapped to the location of the finger on the tablet. The z-axis is mapped to the pressure applied. The spindle would always be spinnning at 12000 rpms and the material to be milled shuld be soft. EMI is a prototype and the first step of a much more ambitious project, that is creating an interface for refining digitally manufactured objects. 2. Plug and Wear basically do what I want to do. I decided to use Velostat to build my sensors. Velostat is a semiconductor that varies its resistance value when compressed. The first step I made was to build a 3x3 matrix sensor, with 3 rows of copper tape perpendicular to 3 columns. I also cut some vinyl to separate each track, so that I could limit the interfeerence. I red the values with the arduino and I noticed that despite some fluctuation, I could really see which sensor was pressed on the Serial monitor. That motivated me to make a larger one. I started with the overall design, but also with my interests. We found a drill bit that could mill low-thickness aluminum and, since I tought it was cool, I decided to mill the frame in such a way. I milled the 2mm aluminum frame with the Onsroud bit 65-025. That has the proper coating for aluminum and does not really require cooling mechanisms. For the settings, I left the spindle spin at 18000rpms, the feedrate at 25inches/min and the pass depth at 0.5mm. It went smooth, the cut was really precise and the material did not heat up. I made the rest of the frame with the lasercutter, using plywood. After that, I clamped the wood frame to the aluminum frame and I poured both Sorta Clear Silicone 37 and OOMOO, at different times. I wanted to experiment with the different texture that the touchpad would have had. Eventually I preferred the clear silicone, even though it came out with a lot of bubbles. All the copper strips were made with the Roland GS-24. We had a spare copper tape roll and I used it. Besides, I decided to have a look at the Roland camm sofware, instead of using Fab Modules. I looked up here for information. The interface is actually basic and honestly not really versatile. However, it has a cool feature: from software it recognize the width of a roll or the dimensions of a piece of vinyl, so that you get an actual representation of it on the drawing screen. I cut with force 85 and speed 4cm/sec. The result was good, only few minor mistakes. Then I put all the strips on the support. On the one side I attached them on a wood support that I made. On the other side I taped them to the silicone. Everything started to come together and I liked the look! Then I made the stickers to isolate the traces, so that only the touching points would be exposed. I used simple black vinyl. After that I made another vinyl mask and I attached a square of Velostat on top of each circle (11x15). That should reduce the interference between each sensor. Eventually I made a simple mold for spacers, so that the columns and the rows could be somehow in tension yet never completely touching. Before I moved on to the electronics design, I soldered the pins to the traces and I connected everything to the multimeter for testing the resistance values on each trace. Starting from the middle row, I measured the resistance values on the columns. They all varied in between 1.5M and 2.5M. I therefore decided to put a 1Mohm resistor on each analog read channel. I was positively impressed to see how nice the copper actually was to work with. You can solder on it properly, it is totally bendable. Just cool! In the final design two things were missing: first, a gripping handle and then a back cover. I designed the first with solidworks. Even though it was printed with high-quality settings in Cura, the result was really mediocre. And here is the final design! I am overall quite satisfied with the look, even though it is definitively too bulky. After I had made some preliminary tests with the Arduino Mega, I started to think about how to get the same pinout on a self-made board. In fact, I needed 15 analog read inputs and 11 digital write outputs. Taking the advice of my instructor, I implemented two Multiplexer/Demultiplexer on a Satshakit. In particular, I took the Eagle file of the Satshakit Micro that I modified a bit during Week 15. Starting from there, I added two HE4067BT ICs. Despite it was the first time that I used such a component, I quite easily understood their work flow. A multiplexer 1:16 needs 4 digital pins to be controlled in binary, Enable pin attached to GND, the actual signal pin to be multiplexed, Vcc and GND. In designing my board, I wanted to make something that I can perhaps use again in the future. Therefore I did not put the resistors on it in the first place. As shown in the schematic below, I could not bridge two pins, so I attached them later with two jumpers at the back of the board. I lasered the board following the instructions I put in Week4. When soldering, I decided to bring out only the communication pins from the Satshakit: ISP and RXTX Serial. The writing pins could be attached directly to the copper strips. The analog input pins, though, had to be wired to ground via a resistor. Each one independently. I therefore designed a small board to locate at the back of the main one. Since I needed the exact pinout, just mirrored, I did simply draw on it with Illustrator, which was overall a quite bad idea. It took more time than what I had anticipated. The pictures below show the result. I eventually put 1Mohm resistors on each analog reading pin. The Satshakit Micro can be flashed with the Arduino IDE. I did it and I compiled, with the great help of Pietro Rustici, the following piece of code. Basically, I get a matrix on the serial monitor where I see which point in the tablet is pressed. I moved from analog reading to digital reading because of the confused data that I was reading at first. Appearently it is not as easy as I thought and it is not scalable from 9 to 156 sensors, as I tried to do. The board needed the ISP programmer in order to be programmed, as shown on the left. I also used the breakout board that I made in week15. The board needed then an FTDI to read from Serial, as shown on the right. The code I wrote with the immense help of Pietro Rustici is below. Below is a videoclip of the interaction with EMI and the Serial Monitor. I mainly believe that the reason why the result is little stable is electrical, not software. Probably each strip amplifies the signal of the next ones. That is also why I scaled it from analog to digital input. 1. This project shows how to hack the spindle with an arduino. 2. Chocolate millin machine is a nice and creative project where a touch screen was attached to the Roland in order to "draw" on chocolate pieces. 3. This project shows an interesting customisation of both the hardware and software of the Roland. The steps to hack the roland are actually quite linear. The support software onSupport allows you to download the Arduino API manual, with a couple of basic instructions. It is a confidential document, so I will only share here the function list of the API. After that, you need to install the drivers for your laptop at this link. After you remove the back cover, you have to plug in an Arduino as shown in the picture below. In order to experiment a little and do some testing I built a simple interface in Processing that could send values to the Arduino over Serial. Note that the Arduino communicates to the Roland driver board through ISP. I loaded the following sketch onto the Arduino, that simply uses the Roland library to control the spindle. It follows the code for Processing, that is simply a 2D canvas to move around the spindle. I ended up using a 2D canvas because I could not control the z-axis of the spindle, it just would not move. I could not find any solution for that, also when I consulted my colleagues. The code is the following. The interface actually looked like below. It would mimick the working area of the Roland and it would show the coordinate points where the mouse is pressed, before moving the spindle there. Thing is that eventually I did not feel much comfortable in putting the two systems together, as both were too little stable and predictable. EMI is overall a highly conceptual project that failed almost miserably when it came to functioning properly. I have two semi-working halves, after all. To make it short, it was ambitious and it does not work as I had envisioned. But that is not such a bad thing in my opinion. I believe in explorations that lead to some unexpected ending or finding, but that is another story. I covered all the different techniques that I could use (I really used all the machines here!) and I learned a lot, both in terms of hardware design and electronics/programming. This time I really had to work starting from content, as 4 months of skill-based and centered work did pretty much kill my little creativity. Grazie a Pietro, Matteo, Flavio for your precious help during the development of this project. Thanks also for calling me "Dora the explorer", making fun of my project and insulting the category of Interaction Designers as a whole. God could bless you all, cazzoni. Grazie at my FabAcademy instructor Fiore, and the other colleagues Diego Galue, Luca, Mario, Diego. Grazie also to the rest of the FabLab Santa Chiara Staff. Cool folks.